Turkey Pot Pie is a delicious dish made from turkey meat and mixed vegetables. 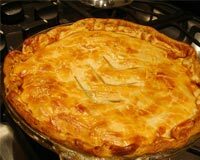 Learn how to make/prepare Turkey Pot Pie by following this easy recipe. Now put one pie crust in an ungreased pie dish. Mix the mushroom soup and milk in a bowl. Combine it with turkey meat and mixed vegetables. Pour this turkey mixture into the pie crust in the dish. Top it with the other pie crust and close the crust edges by crimping with a wet fork. Bake it in the preheated oven for about 45 minutes, till the crust is golden brown.